For many people a trip to Antarctica is an adventure saved for their bucket list; something they have thought of doing for many years and haven’t yet got around to. Well now is the time to consider planning your trip, as a total solar eclipse will happen in Antarctic waters during the early morning of Friday 4th December 2021! Several expedition cruises are planned to witness this amazing event in one of the most incredible settings possible and it can be challenging to determine the difference between them all. What is a Total Solar Eclipse and what is unique about seeing this in Antarctica? A solar eclipse occurs when The Moon moves in front of The Sun as seen from a position on Earth. During a total eclipse, the entire Sun is covered as the Moon blocks out any sunlight at a specific location on Earth. What makes the 2021 Total Solar Eclipse in Antarctica particularly unusual is that its path is east to west; the opposite direction to most eclipse paths in lower latitudes. This phenomenon is only possible in polar regions. When and where will the Total Solar Eclipse occur in Antarctica? November 23, 2003 was the first time that a total solar eclipse had been witnessed in this region, and the path of The Moon’s umbral shadow quickly passed over a section of the white continent. Those lucky enough to witness it might have thought this was a ‘once in a lifetime’ experience, however in the early hours of December 4, 2021 a second eclipse will take place at the edge of the sea ice in the Weddell Sea, between the South Orkneys and South Georgia. You’ll be best placed to see it in the open ocean between South Georgia Island and the South Orkney Islands. What about weather conditions? How can you be sure that you will witness the Solar Eclipse in Antarctica? Antarctica and the entire Southern Ocean are renowned for wild weather and the most important factor in witnessing a Solar Eclipse is of course clear skies. Like any operator, we cannot guarantee clear skies however any of the vessels we work with are equipped with state-of-the-art technology to find the best possible viewing area. We have allowed enough time in the expedition schedule to maximise the chances of finding a break in the weather if the path of totality experiences cloudy weather. How do I witness the Solar Eclipse in Antarctica? The only way to witness the Total Solar Eclipse is on an expedition cruise which will position itself in an area under the path of totality, so you can enjoy the full 1 minute and 54 seconds of total darkness expected. 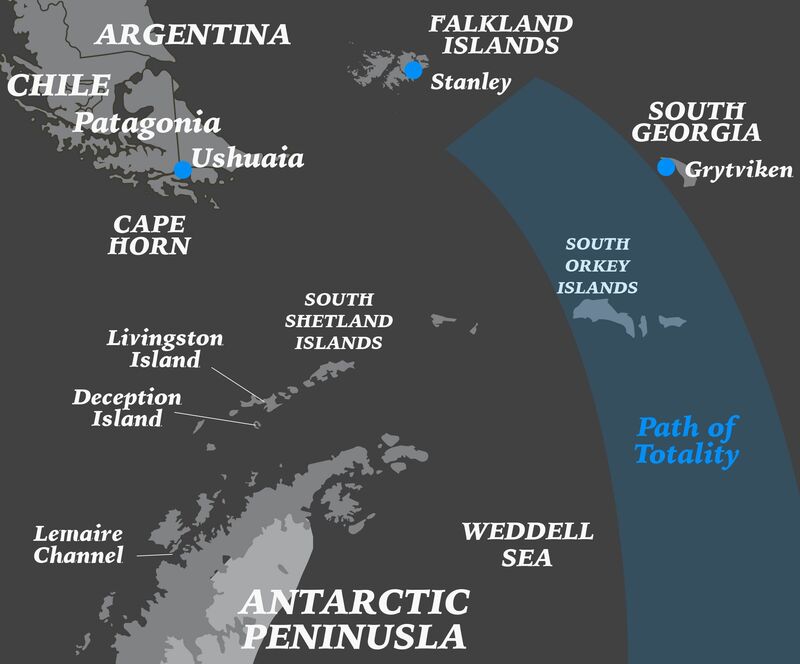 Not all vessels have released their itineraries at this point, however we already have several options and all are following a similar idea which is to combine a ‘Best of Antarctica’ style itinerary that coincides with the Total Solar Eclipse between South Georgia and Antarctica. These cruises combine the majestic Antarctic Peninsula, the Falkland Islands with their rich and storied history, and the South Georgia islands which for many are the absolute highlight of the region and have rightly been called ‘the most staggering wildlife show on Earth’. First and foremost Eclipse Travel are Polar Expedition specialists and all our team have been on a polar expedition. 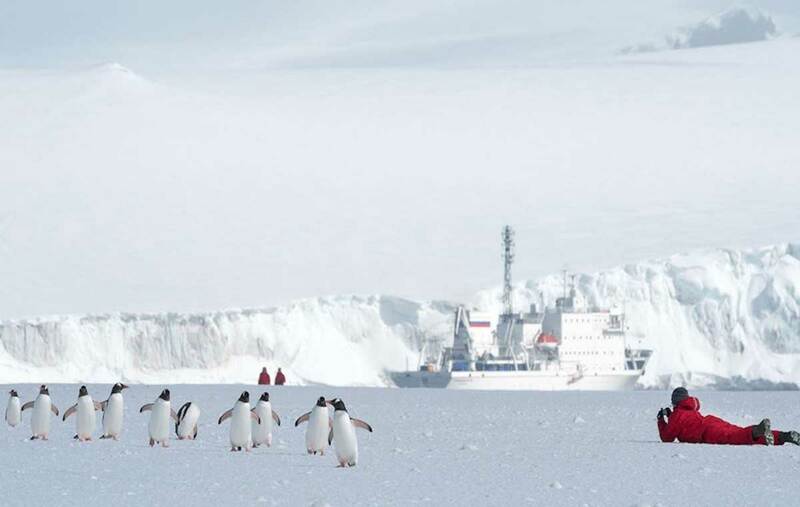 We work with all the expedition vessels travelling to the Polar regions and pride ourselves on providing unbiased advice in order to help you choose the most appropriate vessel for you. Factors such as the standard of the vessel (mid-range, superior or deluxe), cabin type, days on the ship and size of the ship all have an influence on the price, and we can help explain why to consider one vessel over another. One thing our team all agree on is that small ships provide the most intimate experience, enable you to access more areas and smaller landing sites. Smaller vessels also speed up the process of getting off the ship into zodiacs and onto land which gives you more time to explore. Then there are also the regulations to consider. IATO (International Association Of Antarctica Tour Operators) has very strict regulations which apply directly to ship size: “Vessels with more than 500 passengers shall not make landings in Antarctica” and “A maximum of 100 passengers may be ashore from a vessel at any one time, unless site specific advice requires fewer passengers.” Quite simply this means that if you want to guarantee a shore landing at each location then you need to consider a ship with under 100 passengers and there aren’t many of these. Eclipse Travel have an exclusive charter on the Akademik Ioffe and when we constructed this itinerary we put a lot of thought into how we could best ensure that our clients enjoy an incredible Solar Eclipse as well as an exceptional Antarctic cruise. We came to the conclusion that a shorter Classic Antarctica Peninsula voyage combined with the Solar Eclipse wouldn’t be feasible due to the several sea days it would require to deviate to reach the path of totality. Late November and December is a prime time to visit Antarctica and by organising the itinerary in the way we have we feel we have ensured our clients will not only enjoy an uncompromised Antarctic voyage but also have the best chance of witnessing a Total Solar Eclipse in all its glory. How much does it cost to witness the Solar Eclipse in Antarctica? Quite simply Antarctica is an expensive destination to visit at any time due to its remoteness and fuel usage, which on ice class vessels can be very high. Maintenance costs to ensure a high level of safety and high staff to passenger ratios further increase the costs of operating these voyages. A typical price is in the vicinity of US$1,000 per person per day, and this can be higher or lower depending on the standard of the vessel, type of cabin and the inclusions of the particular voyage. You can view our range of cruises to witness the Solar Eclipse in Antarctica here and we currently have some enticing early booking discounts on offer. The demand for Antarctic cruises in the last few years has been extremely high and the general rule has always been that the earlier you book, the better deal you will receive. We expect this will be especially the case for these solar eclipse voyages. While an Antarctic cruise can be seen as expensive you need to consider that an Antarctic expedition includes all your meals, transportation and activities, other than a few optional adventure activities like kayaking which costs a little more. In reality this price is comparable to a holiday in some parts of Europe however everything is paid upfront. Plus (and I may be biased) I would say you would be hard pressed to have a better holiday than a cruise to Antarctica with its incredible scenery and wildlife encounters. Throw the chance of witnessing a Total Solar Eclipse in such a wild and remote corner of the planet and your memories of this trip are sure to last a lifetime. Hopefully this is a handy guide but please don’t hesitate to contact us below if you would like more information.